New York is known as the Empire State, the fourth most populous in America. While New York City is perhaps its best-known destination, the state encompasses everything from busy cities to remote farmlands. Long Island offers seaside living while the upstate area provides access to winter sports. Yeah, you can find pretty much anything and everything in New York - all year round. No matter what the season, there's always something fun and interesting to do. Here are 20 of the best. These glorious acres were established in 1891 in the Bronx. Wander through 50 different gardens and groves of established trees (some over 200 years old). It's one of the best ways to shake off the winter. This huge sculpture garden in the Hudson Valley is set against a backdrop of mountains. There are wonderful pieces from Alexander Calder, Isamu Noguchi and more, all displayed in gorgeous natural settings. Located in the Finger Lakes region, the waters come alive after the winter snows melt. There are 19 breathtaking waterfalls along two miles, and dozens of scenic spots. No wonder it regularly ranks in the top 10 of best state parks in the country. After the harsh, grey winter, even the crankiest New Yorker finds something to smile about in the city's urban garden. There are 840 acres, encompassing historic landmarks, water features and beautifully-established flowering trees. During the spring, butterflies are everywhere at Belmont Lake State Park on Long Island. You can spot them as they fly low to the ground or emerge out of tree hollows. It's one of Mother Nature's best shows! Coney Island has been a New York institution for over a century and the Cyclone roller coaster is one of its legendary thrill rides. After you're done screaming, there are plenty of other attractions to take in within Luna Park. A classic way to spend a summer afternoon. The Saratoga Performing Arts Center is a wonderful space that serves as the (cooler) summer home for the New York City Ballet, the Lake George Opera and more. New York is home to some fantastic beaches that run for miles along Long Island. 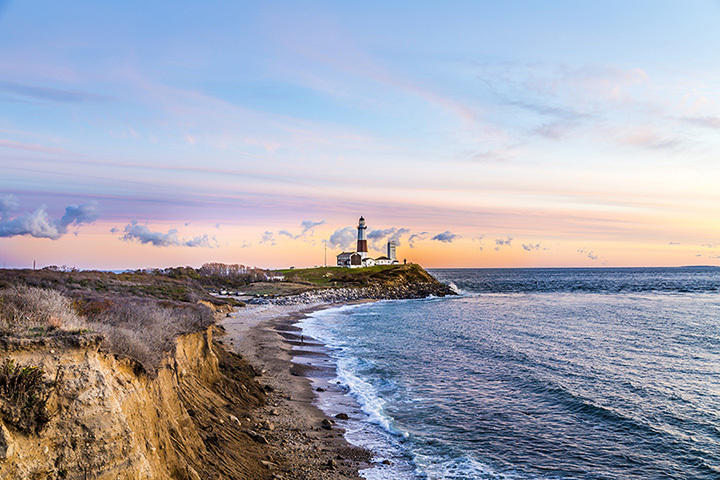 From Jones Beach, all the way to the semi-remote Montauk Point. Swimming, surfing, fishing - it's all here. There are dozens of wineries in the Empire State - including the oldest one in America. Brotherhood Winery, located in Washingtonville in the Hudson Valley, has been making wine since 1839. Cheers! During the hot days of summer, cool off at America's oldest state park. The Maid of the Mist boat ride gets you up close to the falls. There's also an aquarium, self-guided tours and many more ways to experience nature's own water park. Upstate New York is absolutely breathtaking during the autumn and one of the best ways to "leaf peep" is from a hot-air balloon. There are many companies who offer a birds-eye view of fall foliage. The High Line is a popular elevated walkway in downtown New York City - and every Tuesday night through the end of October, high-powered telescopes allow for a view of celestial wonders above Manhattan. And it's free! The National Baseball Hall of Fame and Museum in Cooperstown is the perfect place to visit during the playoffs and World Series. The hallowed history of America's pastime is traced through fantastic exhibits, memorabilia and displays. It's one of the most popular natural attractions in the state and has drawn crowds since its discovery in 1842. Year-round tours give you a fascinating look at this unique world, 156 feet beneath the surface, that includes an underground lake. Fall is when Broadway mounts many new productions. The TKTS booth in Times Square offers discount deals on the day of the show - up to 50 percent off. Choreographer George Balanchine is responsible for all those local productions of this holiday ballet (he imported it from his native Russia). His New York City Ballet does the best version, with giant mice and a Christmas tree that grows to enormous size. During the holiday season, the store windows along Fifth Avenue are a marvel of creativity. Spend some time strolling along this famous shopping venue and take in the magical street side visions (which are typically a year in the making). Less than an hour from Albany, this mountain resort offers fantastic spots for skiing and snowboarding. After a long day on the slopes, check into the spa for a relaxing massage or sauna. The Lucille Ball Desi Arnaz Museum & Center for Comedy in Jamestown pays homage to the city's most famous daughter. There are recreations of Lucy and Ricky's apartment, interactive exhibits and more tributes to the famous redhead. There are a ton of great ones throughout the state, but if you have to pick just one, the Metropolitan Museum of Art in Manhattan is it. Their collection of over 2 million objects gives you plenty to marvel at on a grey winter day.